Three days ago I was on the blog tour for this book. Although I had committed to hosting a guest post and not a review, I found I was able to get to reading the book sooner than I thought although not quite in time to go with my blog tour post. But better late than never I can now share my thoughts about this brilliant book. As the First World War rages in continental Europe, two New York heiresses, Sydney and Brooke Sinclair, are due to set sail for England. Brooke is engaged to marry impoverished aristocrat Edward Thorpe-Tracey, the future Lord Northbrook, in the wedding of the social calendar. Sydney has other adventures in mind; she is drawn to the burgeoning suffragette movement, which is a constant source of embarrassment to her proper sister. As international tempers flare, the German embassy releases a warning that any ships making the Atlantic crossing are at risk. Undaunted, Sydney and Brooke board the Lusitania for the seven-day voyage with Edward, not knowing that disaster lies ahead. In London, Isabel Nelson, a young woman grateful to have escaped her blemished reputation in Oxford, has found employment at the British Admiralty in the mysterious Room 40. While she begins as a secretary, it isn t long before her skills in codes and cyphers are called on, and she learns a devastating truth and the true cost of war. As the days of the voyage pass, these four lives collide in a struggle for survival as the Lusitania meets its deadly fate. Oh this is such a wonderful book. I couldn’t have imagined how much I would end up enjoying it. It has that mix of fact and fiction that I love but it can hinder an author sometimes as they can end up sacrificing elements of a good story by trying to stick to facts. Not so here. Oh there’s no doubt that Kim Izzo has researched the story of the Lusitania meticulously but she has also weaved the most fantastic storyline around it. That storyline is one of three incredibly strong women. Sydney and Brooke Sinclair are sisters. They’re New Yorkers and very wealthy young women. It’s their voyage on the Lusitania that is the central part of the story. And there is also Isabel Nelson, a young woman working in Room 40 which was a pre-cursor to Bletchley Park. In the midst of WWI she is busy helping to decode messages sent by the Germans and in particular those relating to the passage of ships in the exclusion zone where they were liable to be attacked. Both elements were equally strong. When we swapped from one to the other I was never disappointed, just keen to find out what was happening with these wonderfully drawn characters. I loved Sydney. The author has drawn aspects of social history into her story as she’s a suffragette and is very much involved in trying to promote contraception. But more than anything else I loved her because she said and did what she wanted in a time when women did as they were told. But let’s not forget about the Lusitania herself. I really could have put myself there, it was so beautifully described. I’ve never been on an ocean liner but it was so easy to imagine the opulence of first class as opposed to the basic set up in third class. Although I had heard of the ship I didn’t know much else and I deliberately avoided reading about it online until I had finished the book. It gave a greater impact to what I was reading and at one point a shiver went down my spine. This is such an evocative, emotional, beautifully written book. I just loved it. With thanks to Emma Dowson for sending the book to me for review. 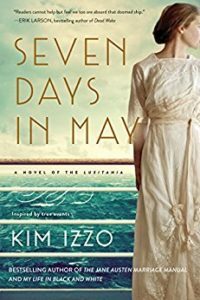 Seven Days in May is available now in ebook and paperback and I heartily recommend it. 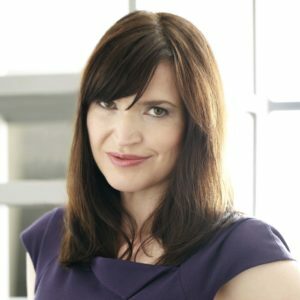 Kim Izzo is an author, screenwriter and journalist living in Toronto. She is the author of The Jane Austen Marriage Manual and My Life in Black and White and the co-author of two etiquette books, The Fabulous Girl’s Guide to Decorum and The Fabulous Girl’s Guide to Grace Under Pressure. Kim’s great-grandfather sailed on the Lusitania and lived to tell the tale and inspire the novel. I really fancy this book. Sounds like something I’d really enjoy… oh my poor TBR piles!! Tell me about it! This really is a fabulous read though. and the blend of fact and fiction is so timely – – – given Hilary Mantel’s Reith Lectures on this/east side of the pond – – prompts the query do the characters/story illuminate the history or the other way round – – plus the rumination that the personal connection crossing the generations strikes me as very moving. I look forward to reading it. A good point, Simon. I think that solid characters and story are what makes any book and in books like these the history adds to it. The history alone cannot make good fiction. I hope you enjoy the book.